The biggest, most common problem I see in my athletes trying to improve their stroke is impatience manifesting as a lack of skill repetition. There's only one way to get better at any skill, which is to Repeat, Repeat and Repeat ...over and over again. I know, it's way too simple to work, right? As we all know, swimming is a very skill-intensive sport and most of us struggle to correct or perfect our stroke in hopes of earning a better and/or faster swim time! Typically we each have that one (or two in some cases) thing in our stroke that we know we need to correct but never seem to get around to putting in the effort to finally fix it for good. Here's how to get it done, hint: you will wish you had done it a long time ago! The biggest, most common problem I see in my athletes trying to improve their stroke is impatience manifesting as a lack of skill repetition. There's only one way to get better at any skill, which is to Repeat, Repeat and Repeat ...over and over again. I know, it's way too simple to work, right? Where's the magic secret coach??!? I know, its perhaps not what you were expecting. But let me explain why this simple, but not easy, concept is the key to taking your swim, or most things in your life for that matter, to the next level and finally reaching those goals you've been talking about for so long. I'll give you an example: today I finally decided it was time to correct an old problem of mine. Since I had my shoulder surgery in 2003, I lost a great part of my shoulder mobility on my dominant arm (left) and lost the ability to fully extend my arm. Because I breath to my right, the extension of the left arm is even more important (balance and body position) so I end up compensating to achieve this extension and it has caused tightness and immense back discomfort and even some hip soreness over time. To correct this problem it is usually an "easy fix". All I need is to breath to the left side so I can extend my arm (right) fully and not have any back pain! Sounds easy, right?? Well, we are all reluctant/lazy/afraid/etc of change; which is also why I say all corrections are not exactly "easy." In some cases, like mine, when the problem was generating pain and affecting your performance to a considerable degree, a change is necessary. I just need to be patent and do the work ! That day has come, and now I needed to come up with a plan on how to change my breathing side from right to left, without getting frustrated, while maintaining my fitness. 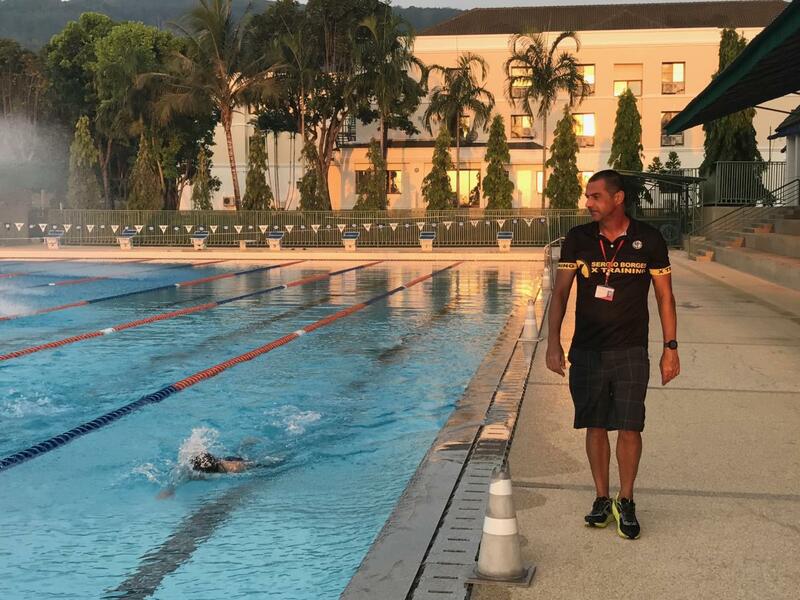 I decide that I need to dedicate 3 sessions a week to correct my stroke and one session I will do "whatever I need to survive" as I swim with my fast Junior Elite athletes. ALL technique work needs to have A LOT of repetition so I will only swim 25m/yds intervals. Cooldown : 4 x 25 backstroke to open chest and move arms different direction. * All with paddles and pull buoy so it makes it easier to focus on technique while keeping HR low due to lower cardiovascular demand. Try this in your training for at least 10 weeks and you will see huge improvement in technique, get rid of a stroke issue once and for all, and get faster in the process!! And do not worry, you will still swim well at all distances, up to 70.3, and you will be surprised with the results! !